Don’t risk voiding your home’s warranty! For the past 60 years, pressure washing has been the go-to method for cleaning dirty and moldy surfaces. But this high-pressure method has unintended consequences when used on your home–tile and asphalt roofs are not manufactured to withstand high pressure or hot water. Pressure washing can harm the weatherproofing of your shingles and expose your home to flooding or interior mold growth. 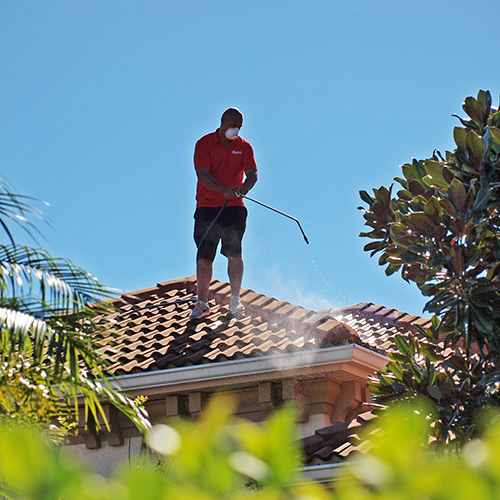 Pressure washing requires someone to walking across most of your roof’s surface. On tile roofs, this can lead to cracking and breaking. Soft-washing is safer than pressure washing. Soft-washing is a low-pressure cleaning method that preserves your home’s warranty, restores the beauty of your roof, and keeps it looking cleaner for longer. 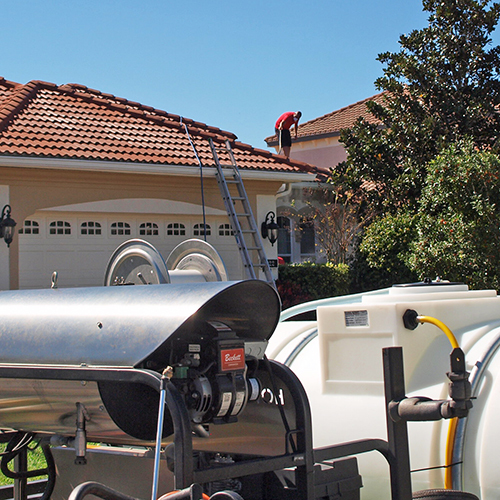 Using a low-pressure pump, our trained professionals spray your roof with a thin, even coat of special detergent. This detergent eradicates mold, dirt and algae, and restores your roof’s true color. In addition, a thin layer of this detergent stays on the surface to protect your roof and prevent growth between cleanings. Soft-washing generally protects your home for three years, but you may also choose a maintenance package to keep your roof looking its best every year. We stand by our work. All of our soft-washing packages comes with a 3-year, “no-black-roof” guarantee. If more than 50% of your roof accumulates growth within three years, we will return to clean your roof for free. We’re dedicated to protecting your home’s investment. Our conscientious technicians are trained and certified in the latest soft-washing techniques, and abide by strict safety guidelines. Our equipment allows us to clean your entire roof while minimizing the need to walk across your roof’s surface. We protect your home and the environment. Our soft-washing detergents are tested and approved for residential homes, and will not harm plants or pets. Soft-washing is a smart option for roofs of all types and sizes. Contact us today to learn how we can help keep your home looking great.